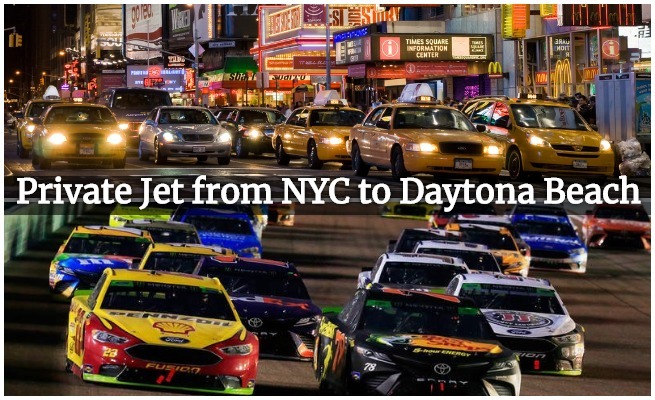 Book a private jet from NYC to Daytona Beach with Private Jets Teterboro, the leading charter broker in New York City, NY. Enjoy the best deals on private flights with 24/7 on-demand charter services at Teterboro Airport and other private airports in New York. Private Jets Teterboro enjoys access to more than 10,000 planes based for flights between New York and Daytona Beach, one of the most popular business jet routes in the country. We’ll compare rates from our approved network of operators to find you the best deal on a private jet to Daytona Beach, including empty legs that need to return to the Space Coast. After your private flight is booked, our team can customize & personalize your experience with gourmet in-flight catering, luxury ground transportation, private helicopter rentals, yacht charters, and more. You’ll depart via private terminals at Teterboro Airport (KTEB), saving hours by avoiding long security lines at JFK and LaGuardia; you’ll also enjoy levels of comfort and privacy you won’t find with even first-class air fare. In addition to Teterboro, we arrange charter flights out of White Plains, Farmingdale, and other NYC airports for even more streamlined travel. Looking for a private flight from Daytona to New York? We have amazing rates on charter planes in Florida for clients returning to New York, and unbeatable prices on empty leg flights to NYC. For pricing and availability on private jet charters to Daytona Beach, or for more information on aircraft rentals in NYC, e-mail us or give us a call at (888) 987-5387. The cost to rent a private jet to Daytona Beach from NYC will start around $8,000 for one-way flights in a light jet. Depending on the size aircraft chartered, round-trips will range between $20,000 to $50,000. Check out some of the example costs to charter a private jet from New York City to Daytona Beach, FL. Following the success of the 100, Embraer took control of the light jet market with the Phenom 300, the world’s best selling business jet since 2013. While it’s considered a small jet, the 300 is in its own class, competing with popular midsize jets such as the Citation XL and Learjet 45 with comparable cabin size, performance, range, and pricing. Offering a BMW-designed interior cabin with comfortable seating for up to 8 passengers and a range of 1,800 nautical miles at high cruising speeds, the Phenom 300 offers the largest baggage compartment in the light jet category, and the best cabin pressurization in its class so you can remain productive, or simply relaxation during your flight. The Citation XLS is loaded with features that are typically reserved for larger business jets. It’s a great plane to take your business (or pleasure) global, whether you need an office in the airspace between NYC and Daytona, or you need some extra rest during your flight. Its spacious interior comfortably seats between 6 and 12 passengers, with optional configurations that can include divans & sofas, and fold-out hideaway tables. The Citation XLS will also get you from NY to Daytona quickly, cruising at speeds of more than 500 mph while also certified for short runway landings, expanding your airport options. The Gulfstream G550 is a gold standard in luxury aviation, and one of the most frequently chartered jets among executives, VIPs, celebrities, athletes, and other HNWI’s. Also known as the GV-SP or G5, its interior is typically set up to accommodate between 14 to 19 passengers, while typical trips for a group of 8 passengers may consist of eight suitcases, six carry ons, and two sets of golf clubs. The cabin is also equipped to keep your group comfortable, with 100% fresh-air replenishment, low-altitude cabin pressurization, and reduced cabin noise. 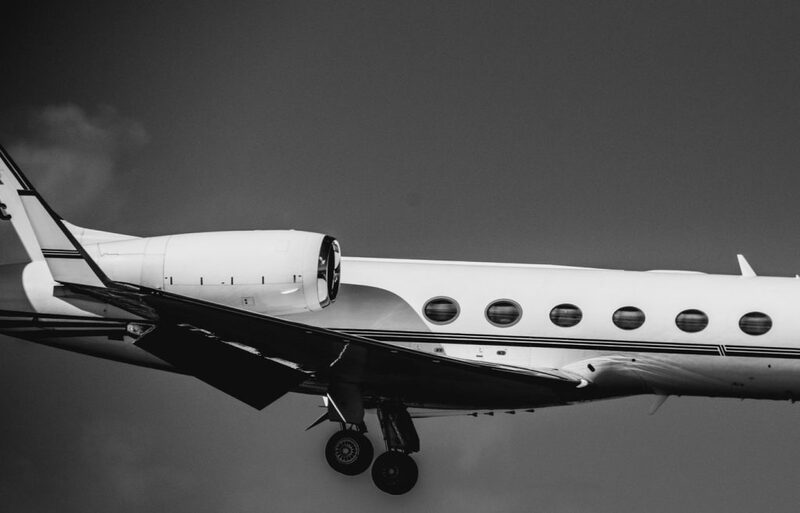 Throw in amenities and office essentials such as Wi-Fi internet, satellite communications, and printer/phone/fax systems, and the Gulfstream G550 is perfect for executive flights. * Hourly rates are for the aircraft rental alone, and do not include fuel, taxes, and operational fees. * Example prices shown are based on previous flights. Prices vary based on aircraft type/model, scheduling, fuel prices, re-positioning, and other factors. Additional services including de-icing, catering, additional flight time due to weather or ATC, Wi-Fi usage, and/or ground transportation are billed separately. Additional airports are available in Daytona Beach, and may change your charter cost. Choose from thousands of private planes for your charter flight, including hundreds of private jets based at Teterboro Airport, the top airport for private jet travel in New York. In addition to Teterboro, we can arrange private planes to depart from other local airports, including Westchester County Airport (HPN) in White Plains, NY; Republic Airport (FRG) in Farmingdale, NY; and Long Island MacArthur (ISP) in Islip, NY. Although the New York Metro area is served by a total of 12 airports, the majority of them are international airports, and other major airports with scheduled airline service. Many executive travelers and VIP jetsetters prefer departing from Teterboro. Airline service is prohibited at KTEB, and the airport specializes in business jets and executive travel, supported by 6 private terminals (FBOs). Whether you’re bringing the family to theme parks in Orlando, pumping up the adrenaline at auto racing and rocket facilities in Daytona, or flying private for a relaxing getaway along Florida’s Space Coast, there are more than a dozen airports in Central and Northern Florida to accommodate your charter flight. When arranging private flights from NY to Daytona, most passengers prefer Daytona Beach International (DAB) as their arrival choice. Facilities at KDAB include a six-gate domestic terminal, three runways, and 4 private terminals (FBO). No matter which airport you choose, you’ll enjoy pay as you go services for each flight, no strings attached. Call us to discuss the airport options and determine which airport best suits for private flight from New York, NY to Daytona Beach, FL. Whether you’re flying individually to offices and meetings in Daytona, relocating the family to a new home in Northern Florida, or chartering a luxurious airliners for large groups, we offer every option for private jet charter Daytona Beach, FL. Private Jets Teterboro works with a network of approved operators to offer on-demand aircraft rentals in your area. Our systems give us access to every charter plane available across the country, including transient planes needing to return to New York or Daytona Beach. Arranging a private flight for your executive team? Wyvern Wingman and ARGUS Platinum private jets can be arranged for corporate travel, and executive airliners are available for business groups and special events carrying up to 180 passengers. Whether you’re looking for a last-minute private jet rental or planning ahead to find the best price, our experience allows us to offer competitive rates on private charter flights without sacrificing safety, quality, or comfort. Call us at (888) 987-5387 for instant ballpark pricing and aircraft availability on private jet charters from New York, NY to Daytona Beach, FL. 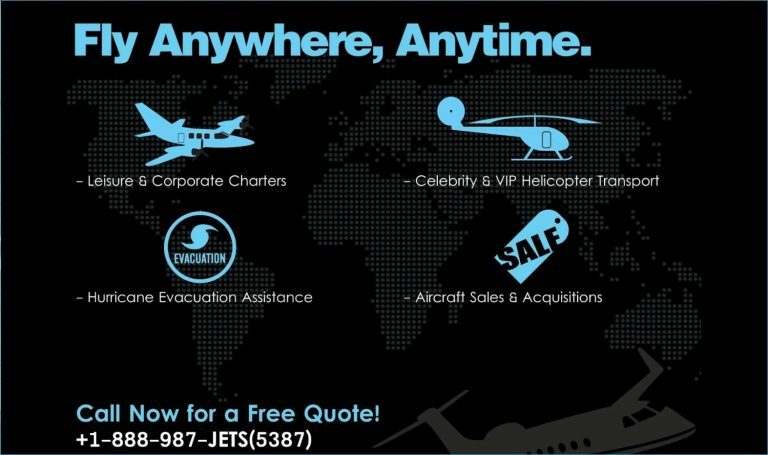 Call us at 1-888-987-JETS (5387) to find the best deals on private jet charters from NYC to Daytona Beach. We offers on-demand air charter services while applying the highest levels of safety and service in the industry. Enjoy competitive rates and gain instant access to thousands of planes for your private charter flight from New York, NY to Daytona Beach, FL.